Once a player has been deemed to have a soft tissue injury and has been removed from the field of play, initial treatment must be commenced. The treatment a player receives immediately after an injury occurs can significantly affect the ongoing severity of the injury and greatly affect the length of time for the injury to recover. The aims of the initial treatment is to reduce inflammation and bleeding, reduce swelling and reduce pain. By reducing all of these factors there will be less scar tissue formation, and improved mobility all of which will improve healing. An injury typically needs to have a relative rest period of 2-3 days to allow the bleeding to stop, and for new capillary blood vessels to form. The first principle is protection. The purpose of protection is to avoid further injury to the area by protecting the injured structures. The type of protection used varies depending on the injured area but may include an ace bandage, aluminum splint, sling, protective tape, or over-the-counter brace. These devices are applied so that the injured structures are protected from further injury. For example, an individual who recently suffered an ankle sprain may initially wear an ankle brace. A good ankle brace should protect the athlete from movements of inversion (movement of the ankle/foot inwards) and eversion (movement of the ankle/foot outwards) because those movements could further injure the damaged ligaments, but would allow the ankle/foot to move up and down. The purpose of resting is to allow the body’s own healing processes to naturally occur without being impeded by movement of the injured area. Any increase in movement of an injured tissue results in increased circulation to the area which in turn may result in further damage to the injured tissue and/or increased swelling. Gentle movement will help during this period to help remove the swelling and injury debris that has built up, but it does need to be gentle and relatively pain free. For injuries to the lower extremities, crutches may be a good option for resting the injured area. If an athlete is in enough pain to have a noticeable limp, the athlete should be placed on crutches. The crutches provide a safe means for the athlete to move around while ensuring that the damaged area is not stressed. Athletes can either be non-weight bearing on crutches (injured leg is bent with full weight of athlete on crutches and uninjured leg while walking) or partial-weight bearing (partial weight is placed on injured leg). Athletes may use a combination of these two gaits starting with non-weight bearing for the first 48hours and then moving to a partial-weight bearing gait. There are a number of types of cryotherapy that can be used effectively to treat injuries. The most common is a standard ice pack. 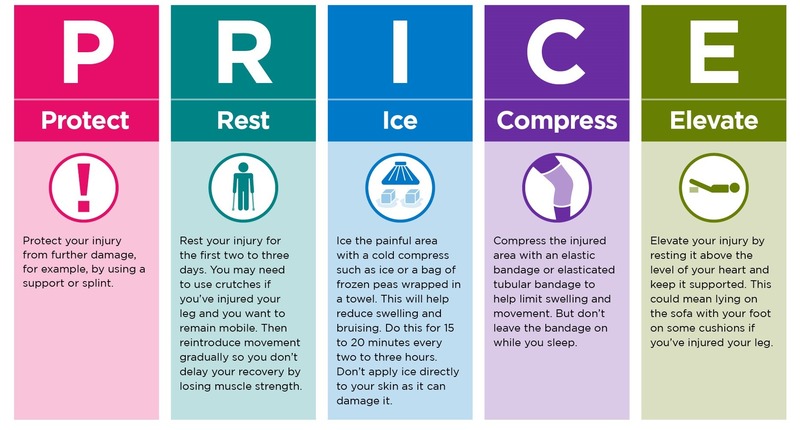 Ideally, ice packs are made of crushed ice because the crushed ice is more comfortable for the athletes and conforms to the contours of the injured area better than cubed ice. Ice can be placed into plastic freezer bags. A light barrier should be placed between the skin and the ice bag (paper towel) to prevent injury to the skin during the application of the ice. The ice pack can be secured with an ace bandage to create some compression as well. The ice should be applied for 20 minutes at a time and then removed. This can be repeated every two hours while the athlete is awake. Some athletes are hypersensitive to ice or may actually be allergic to ice. In this case, the athlete’s skin may become red, raised, and blotchy where the ice made contact with the skin. If this occurs, immediately remove the ice pack and let the area rewarm. A compression wrap should be applied to the injured area. The compression wrap serves as a mechanical barrier so that swelling is minimized in the injured area. There are a number of compression wraps available on the market, but the most commonly used is an elastic compression bandage or tubular compression bandage such as tubigrip. Elastic bandages come in a number of sizes (2”, 3” and 4”) and should be selected depending upon the body part that needs to be wrapped. Elevation is important immediately post-injury to reduce the amount of blood flow to the injured area. For the lower extremities, the athlete can elevate his/her leg by lying down and elevating the injured limb on pillows. The key is that the athlete needs to have the injured area above his/her heart level. The final R in P.R.IC.E.R is REFERRAL. Ensure your player is referred to a health practitioner for a complete assessment of their injury and so that a complete rehab plan can be commenced. 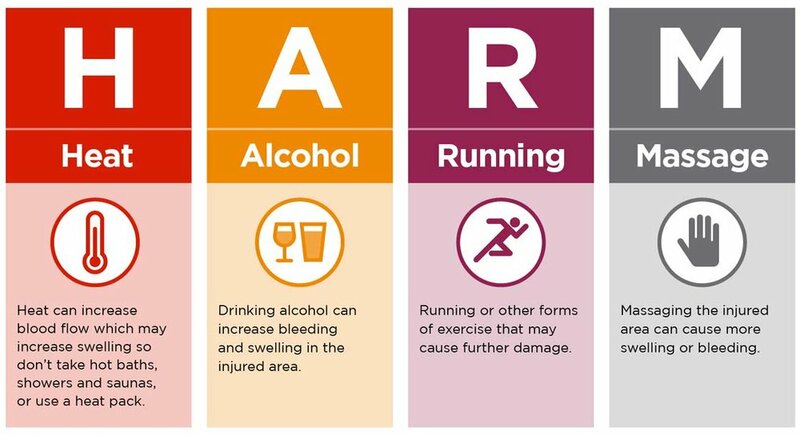 In the first 3-5 days follow the below acronym to prevent further tissue damage, bleeding, swelling and pain.